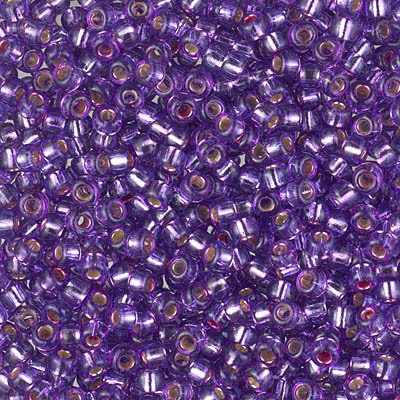 Here is the 100% polyester metallic thread from Kreinik, in 10 meter and 20 meter spools, Tapestry Braid #12. 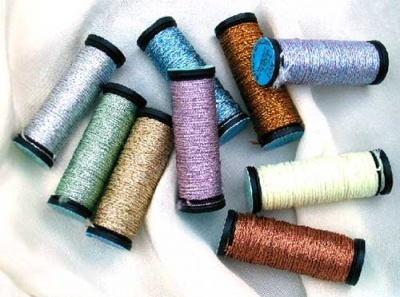 These are the threads which we use in our jewelry kits, both bracelets and necklaces. These are very easy threads to use -- unlike most metallics, I haven't found in these a tendency to kink -- they lie smoothly and work well with just about all of the size beads that we use. In the 'regular' 10 meter spools, we have a large number of colors with quite a variety of shades and hues. The specific colors go in and out of stock as we use these to make up kits for our bracelets and other jewelry items. What we can do here is to offer the spools in general colors. When you are selecting from the drop-down menu, be aware you a choosing something in that color "family." For instance, if you pick pink, it might be a rosy pink, it might be a very pale pink, it might be a rose-hip-almost violet pink. The delicate periwinkle is included in the purple family. If you need a specific color and have the number, email us first, please. These 10 meter spools can also be used for necklaces as well, but for most you will need two for these.